The Gauntlet of Siegfried is a brand new Wonder Weapon in Gorod Krovi that players can build by following a series of mini Easter Egg steps. 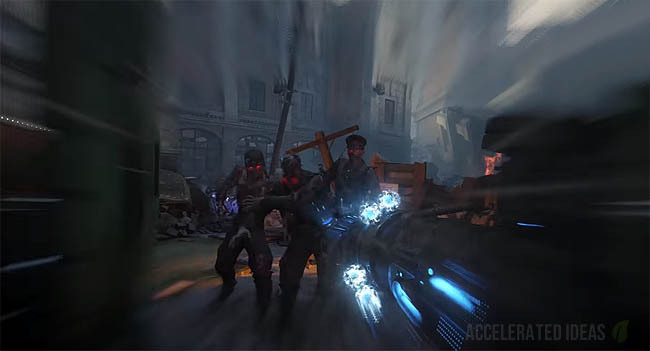 The weapon is a combination of an almighty iron fist that allows players to literally punch their way through zombies with a mechanical arm, but also a portable flamethrower. 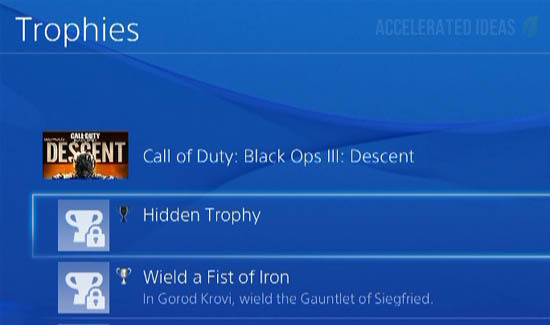 You may remember that the Gauntlet of Siegfried was briefly shown during the official Gorod Krovi trailer. As you can see from the image above, the metallic blue coloured gauntlet is worn on the right hand of the player. It hums nicely with a blue glow protruding through the nooks around it. 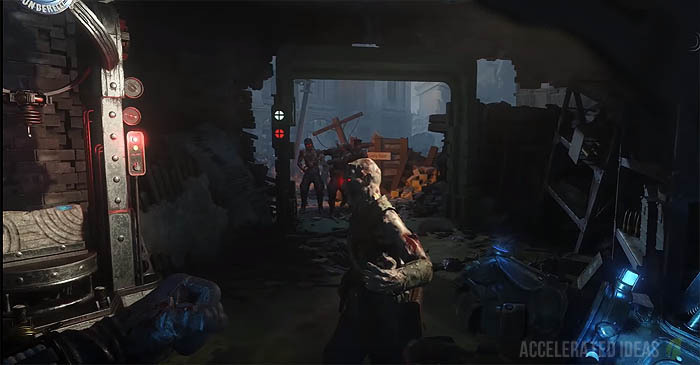 During the trailer, the player charged fist first through a small group of zombies, smashing them into several pieces and sending them flying into the air. 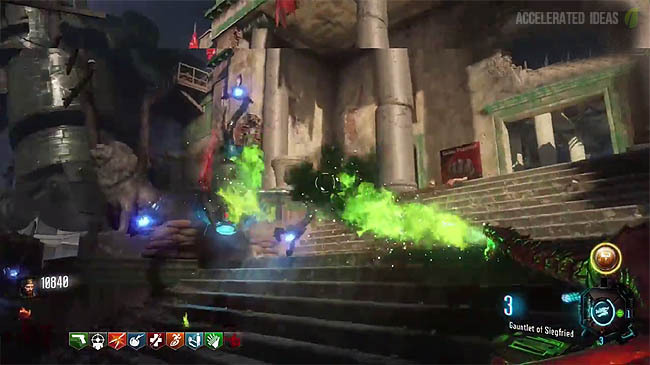 The melee weapon mode behaves very similar to the Thunder Fists from Origins; it has enough power to easily kill zombies in the high rounds and requires no ammo. It does however need charging so you can't run around everywhere smashing everything to pieces. The alternate mode is a mini-dragon (known as the Whelp) that provides a portable flamethrower attack. This little dragon can also be deployed to follow you around and protect you for a short duration. Wield a Fist of Iron - In Gorod Krovi, wield the Gauntlet of Siegfried. As the description implies, players must simply build the gauntlet and then wear it. Note how the term is wield, rather than wear, implying that the gauntlet is permanently strapped to the players arm. The "Gauntlet of Siegfried" doesn't have it's own space in the players inventory screen and hence isn't one of the buildable weapons in Gorod Krovi. Instead, it is claimed by completing a series of steps, much like the "Wrath of the Ancients" bow from Der Eisendrache. Once the steps are complete, the player is offered the weapon for free at which point it occupies the special weapon slot. Once you reach the PaP room look for the sewer pipe entrance which is located downstairs. Stand in front of the sewer entrance, look up and slightly to your left for a Dragon Egg in the rafters. It's lodged in there so shoot it to make it drop down then pick it up. Take the egg to one of the small nests; good examples are in the spawn area or outside the front of the Dragon Command. Place the egg down and let a dragon breath fire to heat up the egg. Wait a round or two for it to cool down before picking it up again. Place the "heated" Dragon Egg inside an incubation chamber which is located downstairs in the PaP building. Now kill zombies in the close vicinity to charge the egg. You'll know it's ready when the status message for the egg changes to "egg needs to cooldown first". Complete another round and the cooldown will wear off, allowing you to pick up the egg again. Take the sewer pipe from the PaP building back to the spawn area. Walk up to the challenges tombstone and interact to claim the gauntlet reward! !